We have had several questions about the “brownish” colouring of our potable water in the Ward 2 area. In a bid to alleviate the fears and concerns that the water is not safe to drink, we have compiled a short summary of what causes the discolouration. The discolouration is a phenomenon that is generally associated with winter and the rainy season of our region. However the discolouration is not only restricted to the Cape, but is traditionally a feature of the mountain water of the western Cape. Soil contains a wealth of organic matter from decomposed plant material. A substance known as “humus” is the primary component of that organic matter. As water washes through soil, particularly in the winter rainy periods, it washes away the humic acids from the humus in soil. The higher the level of Humic Acid and depending on the molecular structure of the compound the water will vary in darkness. 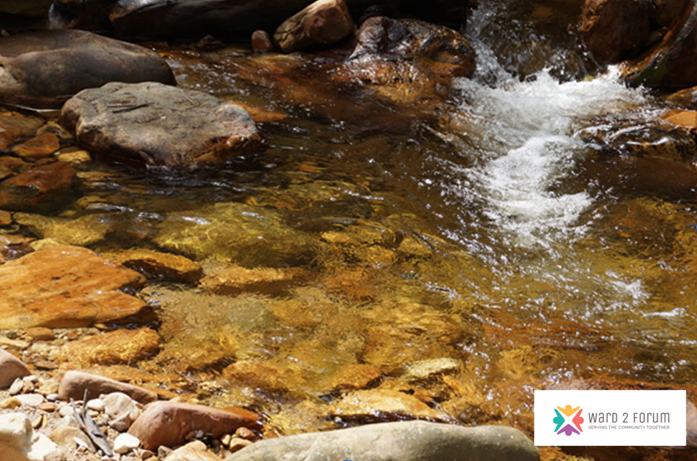 Due to the richness of the biodiversity of the Western Cape the humus content of the soil in the catchment areas of our mountain water is very high and thus prone to leaching during winter rainy periods. The release or leaching out of the Humic Acids is a vital part of our Cape ecosystem, which allows the rich mineral to travel downstream into alluvial plains and is the building blocks of Vlei and wetland areas. The molecular structure of the Humic Acid promotes the uptake of oxygen in plants. Humic acids are complex aromatic macromolecules with amino acids, amino sugars, peptides, aliphatic compounds involved in linkages between the aromatic groups. The hypothetical structure for humic acid contains free and bound phenolic OH groups, quinone structures, nitrogen and oxygen as bridge units and COOH groups variously placed on aromatic rings. Research has shown these acids to be a very effective tool for regulating metals in both plants and animals. Generally, it is accepted that humic acid is not harmful but rather good for the human body. However the quantities in our water are so low that it will have little to no real affect on humans. In terms of the SANS 241 Drinking Water Quality standard, the determinant that deals with the watercolour is deemed an aesthetic/operational determinant and has no health related implications. To remedy this and to achieve a crystal clear water, as we are so used to, the filtration process being used in the Ward 2 area would have to be modified extensively to allow for a flocculating process to be added to the treatment cycle of our potable water system. However, it is generally accepted that the traditional chemical used to achieve this is aluminium sulphate and notoriously difficult to control and dose. Flocculating agents are either inorganic salts or water-soluble organic polymers. They act by shrinking the ionic double layer, or neutralizing the surface charge of suspended particles, or bridging between particles. The type of flocculent used depends on the type of solid–liquid separation being performed. Flocculants are usually selected by the results of laboratory-scale experiments. Some agents or impurities in them may present toxicological or environmental problems. The general economic trend is the replacement of inorganic salts with organic polymers, which give improved performance. It is thus, in our view, safer to live with the discoloured water that is perhaps aesthetically unacceptable rather than add an additional process & cost of which the outcome is unknown anyway. The ‘brown water’ is perfectly safe, in fact most likely better than other ‘treated’ waters. I livid for many years in the west of Ireland where the water is consistently of a darker tint than in Greyton. I an assure you it is good drinking water. Perhaps its where the Irish got the idea for Guinness. I certainly prefer that brownish tint which gave our Municipality the name Theewaterskloof (Tea water valley) to a possibly chemically not so safe clear water.